Whether your makeup brushes are a professional investment or just from the corner drug store, keeping them clean is important. BrushPearl is an ultrasonic brush cleaner that lets you deep clean them at home, ultrasonically. Creator Katie Barnard is a self-proclaimed germophobe who dreaded cleaning her makeup brushes. During a dentist visit, she learned they disinfect their tools ultrasonically. Katie realized that the same technology could solve her problem. Ultrasonic technology uses “cavitation”—vibrations create millions of tiny air bubbles that gently release dirt and buildup. Fill the BrushPearl with warm water and cleaning solution, then fit your brushes into the lid’s tapered slots. Set the cleaning cycle for up to 10 minutes (twice for heavily soiled brushes), followed by a water rinse. Afterward, prop the lid open and your brushes can air-dry in place—which helps prolong the bristles' life With regular cleaning, brushes last longer, use less makeup, and keep oil and bacteria to a minimum. Your skin will thank you. Hello Grommet beauty fans! I'm Katie Barnard, and I am proud to introduce BrushPearl to The Grommet. 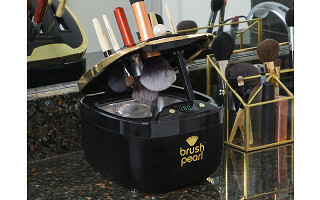 BrushPearl is the world's first digital tool that automatically cleans, freshens, and conditions makeup and cosmetic brushes with the use of ultrasonic technology and BrushPearl Cleanser. I'd be happy to answer any questions that you have! There are a lot of makeup brush cleaners, but this seems to transcend them all. Where did you get the idea for it? I was frustrated with the traditional methods of brush cleaning because they involved scrubbing my expensive brushes. The scrubbing action is really destructive to brushes. It would take me forever to clean my brushes because I tried to do it gently to protect my brush investment. I was at the dentist’s office one day and I asked how they cleaned and sterilized the utensils that they were about to put in my mouth. They explained that they used an ultrasonic cleaner. That’s when I had my lightbulb moment and began my research. What has the feedback from users been like? The feedback has been amazing. You can customize BrushPearl for your needs depending on how soiled your brushes are. Our customers love that BrushPearl cleans their brushes but doesn’t ruin them as traditional scrubbing methods can. They also love that the brushes dry in the proper position conveniently in BrushPearl. No more mess on the counter! Katie, you are so right that good brushes are an investment. I love this idea. Is it easy to clean? Does reservoir lift out to fill and clean easily? Do you need distilled water? I am putting this on my Mother's Day wish list. @Brenda Thank you! Yes, it is easy to clean. You simply wipe it clean and dry when you are done with your cleaning cycle. No, you do not need distilled water. Tap water works just fine. I hope that you have a Happy Mother's Day! Would using Artis brand brushes be an issue? The brush is shaped like a toothbrush and has a rounded head. They're slightly similar to the Cailyn brushes on the site. @Nikki Our wedge shaped holder allows you to put toothbrush shaped handles in BrushPearl! I see there is also a cleanser available. Do you need to use it with the Ultrasonic Cleaner, or is just water enough? @Tara It is best to use a cleanser during the wash cycle for the most effective and fastest cleaning result. Awesome idea! What are the measurements for the widest brush that could fit? I have some short Kabuki brushes with the wider bottoms and wondering if they will fit. @Jaime Thanks Jaime! The widest slot is approximately one and a quarter inches in width. How tall is your tallest kabuki brush? 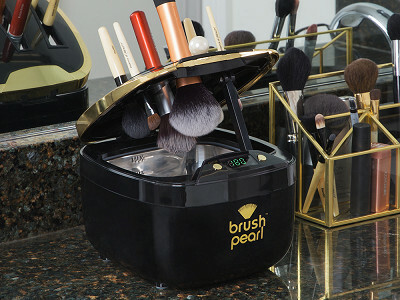 One of the great features about BrushPearl is that it can clean SHORT kabuki style brushes, skincare brushes, and sponges by placing them directly in the tank and not in the holder. They float in the tank while cleaning. @Katie How long a brush handle will this machine accommodate? @Katie - you say the short kabuki brushes can float in the water tank while cleaning them. Won't soaking it in water get the ferrule wet and break down the glue that holds the bristles in place? @Lori I wouldn't recommend leaving kabuki brushes in the rinse water after the timed cycle. We haven't had any issues with break down when they are promptly removed from the rinse water and dried in the upright position where the water falls away from the ferrule. Thanks for your question! @June The brush handle can be quite long as it is outside the device during cleaning cycles. The brush head can be up to 1 1/2 ". How would artist brushes fare with this process? Which leads me, of course, to the very expensive brushes that professional painters use for buildings. While the machine would have to be substantially larger for those, they are in even more need of cleaning. My husband wasted astronomical amounts of money NOT cleaning his painting brushes. @Carole Great question! Honestly, we have not tested BrushPearl with professional paints. Does the BrushPearl remove the tiny clumps of foundation or blush off the brushes that normally require extra scrubbing? If so, how? @Kelli I'm terribly sorry, but could you respond to all the bad reviews that your product has received on Amazon from people who have used the device in the real world? Thank you. @Kelli If your brushes are heavily soiled, we recommend that you first gently swirl your soiled brush in the cleanser before adding water to the tank. This helps to break up those clumps and prepares the brush for the cleaning cycle. The first time that you clean with BrushPearl, it may take a couple of cycles to get them crystal clean. After that, a weekly cleaning should be sufficient depending on your makeup use. BrushPearl has five timed cleaning and rinse cycles so that you can customize the process to exactly what your brushes need to become clean. I'm terribly sorry, but could you respond to all the bad reviews that your product has received on Amazon from people who have used the device in the real world? Thank you. @Preston No need to apologize and thank you for your question! We want and welcome honest questions and feedback. We tested the returned units from those bad reviews and learned that we had one large batch of defective units which were sold on Amazon. The majority of the bad reviews were due to their unit not working up to our standards. While this was very disappointing, it led us to the extremely stringent quality control process that we now have in place so that this situation will never happen again. We are grateful for that. The Grommet customers can rest assured that their BrushPearl purchase has been through our detailed quality control process. @Preston My pleasure and thank you! That is very thoughtful and I hope that she loves it! I bought one of the brush pearls several months ago and it wasn't from Amazon. I am pretty sure ordered it directly from the manufacturer. I cleaned my brushes with it one time. I think I ended up running my brushes through about six cycles before I gave up and washed them by hand as they still had make up residue in them. I followed the directions explicitly adding more brush pearl brand cleaning solution with each water change. Granted my brushes were pretty heavily soiled, but who's aren't? I think the concept is a great one but in my personal experience, poorly executed. It was far easier and faster just to wash my many brushes by hand. An expensive mistake. @Nancy I apologize that you had a bad experience! I am concerned that your unit may have been one of the defective ones. We will be happy to replace it for you. Please contact us at customer [email protected] so that we can discuss this with you. Thank you! Thanks Katie. I certainly will do that. I appreciate it. I just looked back at my receipt which is still in the box. The purchasing info says it came from Joyus.com in Oct. of 2015. @Nancy Thank you, Nancy! Our goal is 100% satisfied customers. We appreciate you giving us the opportunity to make this right. Can you use any cleaner or just the specific BrushPearl cleaner. I am thinking about using this for facepaint brushes, but I like to completely sanitize them. @JESSICA Thank you for your question. You may certainly use your favorite cleanser as long as it is a "low foaming" formula. Katie, Can you clean hair brushes with your cleaner? @Elizabeth Hi Libby! No, the brush heads are too long and it is not designed for that use. Thanks for asking! I'd like to know the dimensions of the machine. @Sonja The dimensions of BrushPearl are 9" X 7" X 8.5". Thanks for your question! Whether your makeup brushes are a professional investment or just from the corner drug store, keeping them clean is important. BrushPearl is an ultrasonic brush cleaner that lets you deep clean them at home, ultrasonically. Creator Katie Barnard is a self-proclaimed germophobe who dreaded cleaning her makeup brushes. During a dentist visit, she learned they disinfect their tools ultrasonically. Katie realized that the same technology could solve her problem. Ultrasonic technology uses “cavitation”—vibrations create millions of tiny air bubbles that gently release dirt and buildup.